There’s a big, hidden part to this job of being Mr. Money Mustache that you don’t get to see every day: the stream of really neat emails that seem to constantly arrive. These letters from readers are as interesting as they are varied. Some of them I read aloud to Mrs. Money Mustache, or to my son, or to friends. Although I only get a chance to respond to about one in ten, they’re inspirational to all of us, and I like to think of them as fine, sparkly paychecks that I get for writing this blog. The main reason I write this thing is in the hope of inspiring a bit of social change. Improvements in our way of life by shifting away from buying and wasting, and towards learning and sharing with other people. With unusual wealth just being a convenient byproduct. So when I read that people are actually putting this stuff to use in real life, and getting great results, it makes it all seem so much more real, and worthwhile. So thanks for those letters. I am a just-out-of-college, single, working, commuting woman with debt and a full-time job. I was beginning the job search for something closer and got offered a job. I did not necessarily like the job offered to me, so I thought, why don’t I just stay at my job for another year and see what I want to do after a year of commuting? Your blog post about the truth of commuting was one of the first options on the list given. I read it from top to bottom and I will never be the same. It shocked me that the cost of commuting was so high. I have grown up in a suburban neighborhood where everyone always commutes. Everyone does it. That’s just what you do…at least I thought. Never did I factor in the cost or the price of the time wasted. Thank you for your inspiring post. I look forward to reading more as they are written! Hopefully your posts will help me get out of college-debt as well…if you’ve got any advice, I’ll take anything you’ve got! I’ve decided to take the closer job (4 miles away instead of an hour commute one way) and buy a bike! WOO! MMM Comment:WOW!! Avoiding this one-hour commute alone will save her about $75,000 every ten years in direct costs alone, or several hundred thousand dollars after factoring in the value of the time wasted. And that’s every ten years. All from one blog post? Astounding. Especially when I look at the stats for that article and see that at least 103,000 other people read it on this site, plus ten times as many on the bigger sites that posted it like Lifehacker. The era of the long car commute MUST DIE!! My wife and I are really good at not spending money. We live on quite a bit less than $2k a month and have three sturdy, round-faced little brats. Frugality is an important virtue to practice when you are a farmer and a musician, respectively. A taste for rice and beans six nights a week is also helpful. If I were more willing to learn the song “Freebird,” we could probably scale back our rice and beans intake to five nights a week, but alas, I have principles. I say we are backwards Mustachians because we both grew up in families where consumerism wasn’t an option. I had nine younger siblings. My wife’s father saved money by buying expired meat at the store that was labeled “crab bait” and not using it for crab bait. So we’ve always found it easy to live below our means – we’ve never had the means to do anything else. In fact, only recently have we had enough means for credit card companies even to be interested in us. We’re still working on the Mustachian practice of making lots of money and not spending it. We’ve got the “not spending” part down. I will keep reading your blog to help me figure out the other part. 3. Living in a nice house that I built for $30k in 2 years with no loans. I’m not sure if #1 works in Boulder, but here on the west side of the Evergreen State it’s lunacy not to heat with wood- because it’s everywhere. Our electric bill is $50 to $80 a month. Splitting and stacking firewood is great exercise and a full wood-shed is very satisfying thing to behold. Also, fresh chopped wood smells great. Processing firewood is also a great neighborhood activity, after which, beer tastes wonderful. Making firewood saves more than electricity- it saves you the cost of a gym membership and I think it might save coal in some part of the world- though I am no expert in that department. We built our house out of boards, beams, nails and “Simpson Strong Ties” and we own it. It even passed inspection – so we’re legal. I used a lot of salvaged “free” lumber and other materials which were great, but time-consuming to collect and figure out how to make work. But these materials also give the house more quirkiness and character. For example, every visitor to our house raves about our bathroom sink which my wife found at an auction for cheap. It is very colorful. A joyful sink. If it had come from Home Depot I doubt it would inspire that kind of enthusiasm from our visitors. My kids, however, are happy spitting their toothpaste into any handy receptacle. Our house is wonderful to live in, even if I see a few of the boo-boos I made during the building, every single day. It is easy to heat with our wood stove. We incorporated an “inefficient” cathedral ceiling in our design which we have made efficient by stringing an indoor clothes’ line up there – eliminating the need for a clothes dryer. Since we paid for all the materials out of our own shallow pockets and with $10k of generous gifts from family, we own it outright and have no loans to pay off. The county values it at $120k. 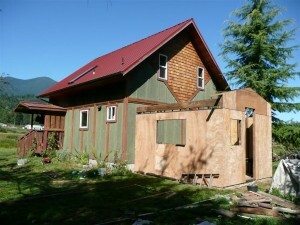 Since we spent $30k building it, you could say we made $90k building it ourselves. It was a very fun and satisfying way to earn $90k – even though it took us two years to build. Now here’s the trick, since we took out no loans to build the house and it is all paid for, could we say that we earned a lot more than $90k? How would we figure the interest not paid on this deal? Perhaps you could help us out here Mr. MM. I would like to think that we did better than a measly $90k, but I’m not sure. MMM Comment: you are correct! For most people to amass $90k of home equity, they have to earn a much larger amount, then pay taxes, pay for their living expenses, battle the backwards treadmill of mortgage interest, and only at that point can they pay off principal of the mortgage. For most, it takes many years and several hundred thousand dollars of earnings to accomplish this. You did it in just two years, while also working your regular jobs. That means you outpaced most $200k earners during those years, or leapt ahead more than a decade towards financial independence compared to most people with lower incomes. Congratulations! Your work here DOES make a difference MMM. As of today I own a bicycle again for the first time in a decade, and in January I’m leaving my 50 mile (hour and a half) round trip per day commute and trading it in for my own office that I can ride the new bike to. 5.5 miles isn’t far! It’s about 25-30 minutes, still shorter than your current car commute. Well, it depends on the traffic. Heavy traffic makes a bike commute seem longer. I agree with Marcia! That a fairly short commute! You are so lucky Mike!!! One of my jobs is about 40 miles away……definitely not doable considering my shifts are at least 12 hours and I can get out as late as 3am…burrrrr. My husband is considering getting a commuter bike for a 40 mile commute one way after he read that article, YIKES!!! He can do it and he is stoked on how much money we will save on gas. MMM – Your blog was a major reason that I retired early, so I’m very grateful for you and the MMM community. I sincerely hope you never stop writing. I just found your site, recommended to me by one of my own blog readers, and I must say, I feel as though I am taking a giant leap forward mentally in reading some of your posts and the comments. I guess they call that inspiration! I am an ex-hoarder who blew through hundreds of thousands of dollars over the years and, daily, I have to face that fact. I am now in a tight spot as the spouse and I try to manage our finances as we pay for 3 of our kids to go to college and as we save for retirement. It’s difficult at times to remain focused because I frequently become overwhelmed with fear and regret but I know in my heart that there is only one way to go and that is forward. This is my favorite personal finance blog. I think every now and then you’d write a boring meaningless post, but not so. Each of your posts are compelling. That’s why it’s fun for me to go back and read previous articles. And the commenters thoughtful ideas is icing on the cake. Wow building a house with your own hands takes some serious skill! Congrats to the writer who wrote in on that. If I had to do the same with my non-existent skills I doubt it would stand up to a rainstorm let alone the hurricanes we get down here in Florida. I’ll do house projects myself but building a house would take a lot of learning for sure! That whole house-building story rocked my face off. I needs me to learn how to build one o’ them. I will begin by reviewing your basic carpentry posts, and advance on to volunteering for Habitat for Humanity, plus a few community college courses on the side, for good measure. Build it and they will come, MMM! wow. two wonderful letters. you earned ’em. I often read your stuff and wish you’d been writing when I was coming up. In that you were not yet born, you are forgiven. but, just hearing/knowing what is possible likely now can make all the difference for others. Regarding yours and the other generous compliments: hopefully people don’t take this post as me asking for even MORE of those reader compliment/paychecks. I’ve already been paid more than enough. What I was really trying to do is to just point out, “Look! See how easy it is for all of us to create positive change?”. If so many people are really this easily influenced by positive examples, then we’ve really got a great chance of fixing things around here. It is simply the lack of the right messages getting to the right people that has been screwing us over thus far. The Internet is helping to fix all of that, as the ability to share information is returned to us, the normal people instead of restricted to media barons and big business. Both you guys are inspiring, Two of my favorite authors! I find myself looking everyday for that new nugget of wisdom that may be there. I am nearly weaned of my spendy ways, instead of a new harley or whatever, I try to save that money and let the dealership keep my new bike shiny and dry. It’ll be there everyday.I will have to ride my older motorcycle and bicycle for now. I think of a new way of frugality everyday. I am ashamed of the money I have squandered. I surely deserved a double sukka punch back then. Please know it makes a difference monetarily and ecologically to our family and many others. Many people who do great things take the secrets to the grave. Thanks for sharing, it gives insight and hope to us. I wish I could tell you both in person. 6 miles a day, 5 days a week is enough to make the difference between “dangerously obese” and “in great shape for life”. That’s 30 miles a week, or 78,000 miles over a person’s roughly 50 years of adulthood. 78,000 / 6 * 9 cents is only $1170. That’s the price of one minor medical outpatient procedure, and some people blow through that in a single month of prescription medications. So, I’d bet my bottom dollar that the health care savings are much more significant than that. I use $5-$10 per mile for my own estimated health-and-wellness value of biking. I definitely agree that 9 cents per 6 miles is an underestimate, but I have no idea of how to estimate medical care saved by mile – how do you count something that doesn’t exist? You might need someone identical to you who doesn’t bike to calculate the difference. Also, I need to thank you for inspiration to bike. I wiped the cobwebs off of my beautiful racing bike today. I used to bike about 8 miles a day in high school and it felt great to feel the wind whistling past my ears again. My college is in the extremely bike-friendly town of Bloomington, IN and I’ve been guilty in the past of driving less than a mile to class. I live on campus. I’m going to start going to the bus stop in inclement weather instead of using inclement weather as the excuse to drive to school every day. I’d bet that the analysis is based on moving the cost of end-of-life medical care out further by the amount of the life-expectancy increase. I read somewhere (can’t remember anymore) that the majority of health care costs happen within the last 2 years of life. There isn’t much difference to the medical cost of acute heart failure at 60 or respiratory failure at 80 except when it happens. Switch cancer for Alzheimers or palliative care homes and I’d wager the costs come out similar just later. Discount that back by 10-20 years and divide by mileage and I bet you get similar numbers. I’d guess this, or at least the concepts underpinning it, are correct. I tried at one point to dig into academic studies comparing the health care costs of smokers to those of non-smokers, and basically, the studies seem to find that smokers cost no more, and maybe slightly less, over a lifetime — higher costs on average per year, but fewer years of life. They were probably only referring to the health cost of air pollution. That’s awesome that you are helping so many people. I hope I can be that person for my generation! You’ve got the power, DFT. Your generation will move as a group like the Greatest Generation. It will not be the endless conflict of the 50+ set or the endless skepticism of mine (30-50). Now stay on your bike and don’t spend too much on college! I am also converted to Mustachian ways and didn’t realise just how mustachian we were as a family until I started reading your blog 2 weeks ago. My husband bikes to work (5.5 miles each way) almost 99.99% of the time and only drives if the weather is so bad it is unsafe, which is not very often. We have always line dried our clothes and use the dryer sparingly in the winter, even with 3 kids it is possible to dry indoors in winter if you are organised, have a large ‘clothes horse’ and make use of the heat from a roaring fire. We have a TV in the house but have not had ‘cable’ or it’s UK equivalent ‘Sky’ TV for over 10 years. We find our kids watch few programmes on TV and the lack of exposure to the rampant commercialism is apparent when compared to other kids we know. They do have games consoles but the time spent on them is limited and there are no moans about this. We bike together as a family often and the kids always ride or walk to school (1 mile each way), something that many kids living much closer don’t do. The only non-mustachian thing I do is commute to work, 18.5 miles each way. Ever since reading your commuting post I am sickened about the wastefulness of this. I am fit enough to bike that distance but the extra time spent doing so would mean I would have to pay for child care which would take away most of the savings. So therefore the plan is to get a job closer to home over the next year and sell our 2nd car (both are paid for and not flashy motors by any means). 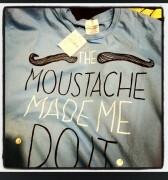 Only then will I be truly mustachian. Oh and I hope to be retired within 5 years. I will be 44, so not as early as you and Mrs MMM but also no where near the scary ages that some folks I know are going to have to work up to. Keep up the good work, the world needs you! $30k? But how much did the land cost? Anywhere with cheap land is not going to be within biking distance of a major source of jobs. Not everyone can work from home. First of all, I’ve found VERY different results in my own real estate shopping. There are many areas in the US right now that combine high-paying jobs AND cheap land and/or houses within biking distance (say, 5-10 miles) of said jobs. My own city (Longmont, CO) is one of them. Phoenix, Tucson, Las Vegas, Reno, Miami (and most of Florida), inland LA/San Diego area, Portland, areas of Idaho and Montana, Albuquerque, and Bellingham, WA are a few other ones I have visited and looked at house listings in. I’m sure there are hundreds if not thousands more. In the US, I feel it’s mostly the NE and SW coasts that display this situation of land values being too high relative to the typical salary. For the rest of us, affordability is all around, thanks to last decade’s housing crash! As for working from home – that’s probably true. But the trend is certainly growing as job flexibility grows. The number of home-based workers around me here in my neighborhood is so large, the concept of commuting through traffic jams is really starting to become a widespread comedy topic. I got the impression tge author was a musician. If so – living just outside a modest city can provide a lot of venues – and compromise little in terms of commuting since it’s likely that nowhere would be close to all. Furthermore – it seems that a big way to avoid those commuting costs is just to not work as much – which is possible once you’re home costs are covered. This website has definitely inspired me. It is now the only personal finance site I regularly visit. Since I discovered MMM, we have cancelled cable, cut our food bill by 40%, I dusted off my bike and started using it more regularly, and I sort of semi-retired from my lucrative but very stressful job so that I could spend more time with my kids. Now I am working on some consulting gigs while the kids go back to school and looking for real estate investments to grow our stash. We are still working on reducing our expenses because we were used to my paycheck but we have no consumer debt and a large stash of savings. We thought we were living below our means and come from a long line of frugal people but MMM has opened my eyes to a new perspective. If more people really thought about how they are living their lives and made meaningful changes to improve their situation, we would all be happier and waste less resources. These were very inspiring stories. The commuting one struck home. Many of my friends commute an hour each way. I am not even happy about our 10 mile commute each way (15 minutes), but at least we can bike it on occasion. Especially now that the baby is sleeping in the occasional 5 hour stretch. And by ” we”, I mean “my husband”, as I’m still on mat leave and not cleared for exercise. When I return to work, I’ll be on half days, so we’ll probably be able to do our “I bike to work, he drives and drops off the car, I drive home, and he bikes home” thing. We work near each other. I really enjoyed the guy who built his own home too. I like the “neighborly” aspect, which is sadly lacking these days. We are lucky to have met some great neighbors in our house. We carpool kids to school and birthday parties, do playdates (never underestimate the importance of a Saturday playdate – when our 6 year old is out, my husband can work on major house projects and yard chores. When we host his friend, they can do things like have their wood floors refinished.) Our neighbor in the back brings us fish, and we “keep an eye on” his teenage daughter when he’s out of town (she’s 18). We share yard tools with the guy next door to trim our shared hedge. We’ve loaned out our sunshade for parties. We’ve borrowed camping gear. We trade tangerines for lemons and avocados. It’s not quite as neighborly as it was for me growing up in the 70’s in rural PA, but better than anywhere else I’ve lived since. We have great neighbors, too, and one of the best things is that one side is much younger and the other side is much older—and we all help each other. The one too old for most outside chores frequently brings food to the tohers, and the youngest tends to do the heaviest outside chores. We, the middle literally and age wise, do easier chores (like mowing) and happen to have more tools to lend. I think we all save money and benefit. I totally agree about the cost of commuting. I used to commute an hour each way to work and it completely sucked. I took a job 6 years ago that is in my hometown and it takes me 8 mins from my driveway to sitting at my desk with a cup of coffee. All the time that I save is truly worth millions of dollars to me. I will never commute again and plan on being retired as soon as humanly possible. I am 32 now. The “True Cost of Commuting” was how I found this site a little less than a year ago. Since then, it’s been a life-changer. I made good money, I already saved what I thought was a lot (30-50% of take home), but I still spent WAY too much (mostly on food and commuting). By altering my spending over the last year, I was able to just “semi-retire” THIS WEEK!! I’ve taken a new position, cut back to 20 hours a week, from home (and making more money to boot… took a 30% pay cut and a 50% time cut). Now I have time to pursue other interests and spend more time with my kids. Full “retirement” is about 3-5 years away. I’m 38. I give you mad props for being the catalyst I needed! Wow, excellent news Chris – mega congratulations! The commute does need to end! Biking to work is so much more fun. We’re doing other things to try and live more consciously, such as becoming vegetarian, taking up yoga and planning our first-ever backpacking trip, none of which are necessarily focuses of this blog, but positive byproducts nonetheless. Can you sort of be FI without enough passive income? My husband and I are used to live on one (maybe one and a fraction) income, so that if one of us loses their job – no biggie. Also, since most, if not all, of the second income is invested – we have enough “safety money” for small emergencies, or big pay cuts. The relatively lean living standard (it is very easy to be “car free”* in greater boston – especially with university-subsidised public transport. My husband uses the monthly pass, and I walk to work about 80% of the time – thereby saving the gym membership) also means that I chose the job I now have by the challenges and satisfaction it gives me, and not by the paycheck it promises. Like I said – we are still in the phase of “more money will be nice”, and will stay in that phase until our saving will produce enough monthly income to live by, but getting there will not change our lifestyle significantly – maybe we’ll just travel more. * I like “car free” (the term used here) more than “carless”. The second term treats a car as a necessity, while the first emphasizes the burden it comes with. Whether you are “sort of” FI I think is a semantics play. But the life you described puts you squarely on the path to “complete” FI. I.e., spend as little of your net pay as possible, save/invest, continue to reduce expenses/optimize your life, and learn to find fulfillment without spending money. Thumbs up for “car free”! It is truly a burden. In my family’s case, not only financially (even though we live in a country where the cost of car ownership is the highest in the world as far as I know), but also emotionally. I was always hyperventilating before any trip where public parking was required, as in our crowded metro it meant circling around the lot or parking garage to find a parking space and then fight another ten drivers to get in there. My husband’s biggest nightmare, however, were morning and evening traffic jams – he really had a bad case of road rage. Now we are car-free since February and LOVING it. I walk to work, my husband takes a bus. He said it is the best feeling just to sit down and do stuff on his iPhone for 30 minutes (that’s how long his commute is) instead of thinking how to switch lanes and get out of the jam. Such awesome letters! Can’t believe he built his house for just $30K. I totally wish I could do that. Although I don’t think I could do without a dryer. We could have built it for quite a bit cheaper than $30k, too, but we splurged in a few areas and made mistakes in a couple of other areas that could have been avoided with a bit more research. The main necessary ingredient is time. If you have more time than money, there is so much that can be done simply by finding perfectly good used materials and doing every bit of the labor yourself. For instance, I could have saved $400 by not hiring an excavator for our foundation. I could have done it myself with a shovel and a wheel barrow and perhaps a younger brother to help out. I think it would have taken me four days. It took the excavator four hours. So I could have made $100 a day getting an extreme workout. Wow – digging your own foundation would definitely be on the extreme end of the Scale of Badassity. Hell, even setting your own forms and calling the concrete company directly (instead of hiring a foundation contractor) would be way up there, and I would still probably subcontract that stage out. From that stage onward, however, my favorite way to build a house is to do everything myself and with friends. Congratulations again M. Ragazzo! We did actually set our own forms and call the concrete company directly, which turned out to be a lot of fun but a bit stressful due to the fact that concrete turns hard and I didn’t know what I was doing. Thankfully, the truck driver was helpful with some pointers. For our little 12 x 14 mudroom my sister’s Kiwi boyfriend and I did indeed dig the foundation ourselves with shovels. We felt quite tough. Yes- building yourself with friends (and family) is the way to go. Makes me think of what old fashioned neighborhood barn raising might have been like – hard work, but fun and rewarding hard work. Very impressive! Can you include some house pictures? How many square feet? Did you subcontract any of the work, like electrical or plumbing? Have you considered building another as a rental? I sent a couple of pictures to MMM – he might post them if he feels they add to the article. Our house is 24′ x 28′ with a partial, loft style upper story. The total square footage is about 1100 but it feels bigger than that to me due to lots of open space. I have considered building a rental. Seems like a great way to make passive income. It would entail a lot of research finding a good priced piece of land. And I would probably need to take out a small mortgage on my house in order to do it – that would be a scary step for me but perhaps I will go there once I have learned enough on this site. I also recently finished building a really cool little studio/office which I only use part time to teach music lessons, write, rehearse and send email. I’ve been thinking about trying to find someone to share it with me for a modest rental fee. Haven’t found anyone yet, though. I tried Craigslist but it didn’t yield the right person. I might try again with a different ad. I’ve been envying people who ride bikes (have disabilities), and I realize that I haven’t been thinking outside the box enough. Perhaps an adult tricycle would work. Now I have to get over the attitude that it’s uncool to ride an adult tricycle when I’m not yet 60. Love the idea of an adult trike! One of the things I wish to get when I retire. My friend with limited mobility has a recumbent (bike? trike? not sure which), and she loves it! I actually invested a little money into my bicycle. Added a DC motor, batteries, etc. Now I actually enjoy riding my bike and getting things done with it. Moustachism have several big enemies. Consumerism is one of them, but we are aware of this enemy. Government regulations is a more hidden but even bigger enemy! If I were to build a house today I would not be allowed to do a lot of things. * Electric work (any kind) is forbidden and have to be done by certified electricians. * Plumbing is forbidden, only certified plumbers can do that. * Forget about doing anything in the bathroom or wet rooms. Only certified companies can work there. * Materials in load bearing construction have to be approved and stamped. * Concrete walls taller than 120cm have to be done by certified companies. * Drawings and plans needs to be done in certain ways before the are approved by council/beurocrats. I positively hate this as I like to do most stuff myself, and do it well! Wow, that sounds unfortunate – where I live, you’re allowed to do everything yourself with no certification or even training at all (as long as you’re working on your own house). It is a wonderful freedom, being able to change your own space and potentially even make a great living at it.. while you learn. You still have to get it inspected to be legal, but that’s just like a low-cost exam for your training course. The inspector is happy to offer tips on how to make things pass the test. The US is pretty loosely regulated compared to most countries, and I try to remind myself this is a good thing in many ways (even while I wish we could pollute less). Thank you very much for all the inspirational posts you have written. This is how you helped me in other ways: firstly I got punched in the face by reading one post about debt being a fiasco. I had thought if I can afford it, it was fine. I had a mortgage on a buy to let. I decided to pay it off aggressively using 45% of my monthly pay and managed it in six years as opposed to the normal 20 years. I am so proud of myself and full of gratititude for your help. Secondly I started walking for 1/2 an hour everyday and that was contra culture. Crime is very high in our country and 72 year old widows do not often walk alone but always finding a convenient extra walker was to much bother. Now I walk safe, sleep better, am healthier by following your principles. I enjoy life. Bless you! 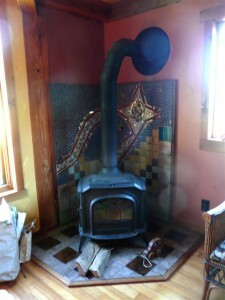 Finally someone mentions the glorious wood stove! 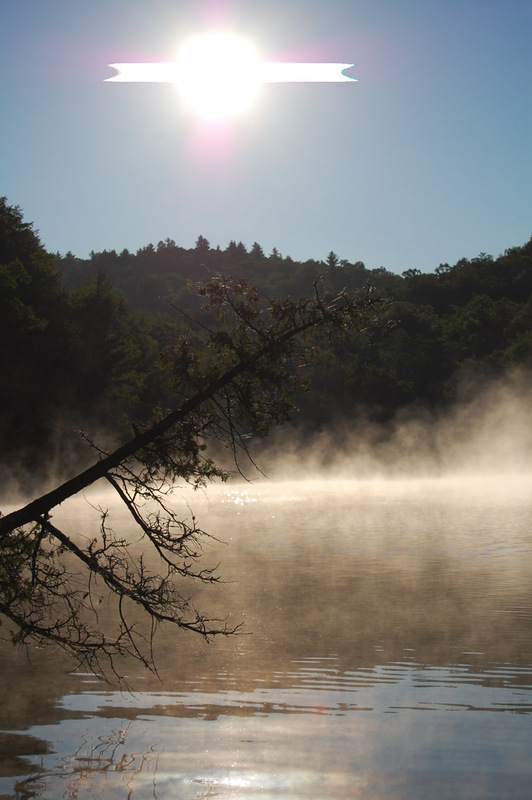 So few blogs address the specific challenges (and bad-assity) of true rural living! I am currently sitting in front of a beautiful fire (in my wood stove), sipping homemade peapod wine, while my sweetie cooks us dinner from veggies saved from our garden. None of these are things I would have thought of as cool in my twenties, but there you have it. 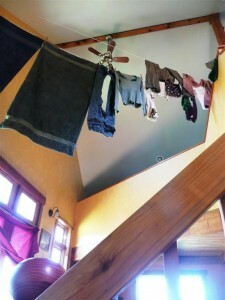 I too can look up toward my high ceiling to see clothes drying, or look down at my computer and chuckle every time a frugal website tells me how to efficiently set my “thermostat”. tee hee . . What’s a thermostat?